I’m a feminist. With an undergrad minor in women’s studies, I worked for decades for women’s rights, first at the National Women’s Law Center and then at the American Association of University Women. I once wrote an article about Gloria Steinem — which she told me, personally, she loved (highlight of my career). So of course I’m going to bring up a strong girl who defies pink, loves STEM, and finishes her sentences without that tentative question mark so many girls use today. 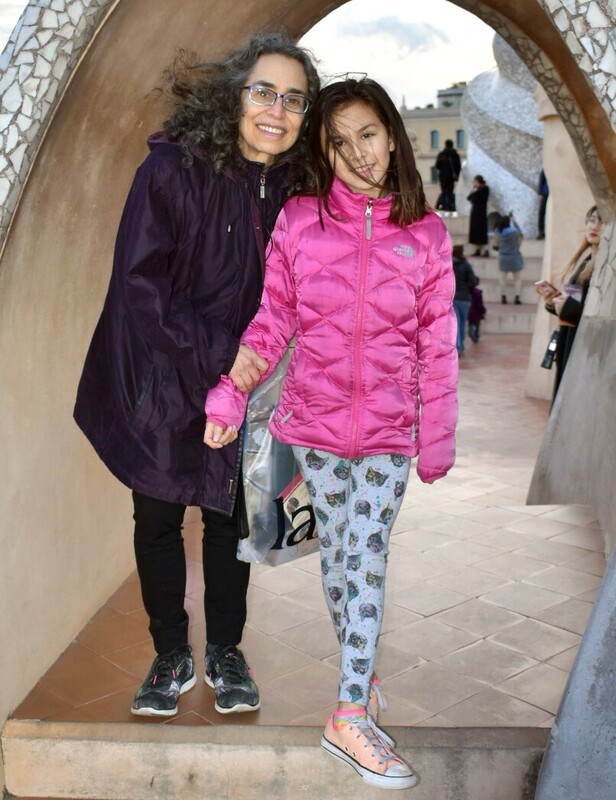 Jodi and her daughter in Barcelona. We loved exploring Gaudi’s Barcelona. Let’s start with pink. Nope, I was NOT going to dress and surround her in pink, pink, pink. I’d tell relatives and friends to send nonpink gifts. I’d pick out nonpink clothes. I’d keep the nonpink hand-me-downs and pass on the rest. You know the end of that story. I quickly hit reality — or should I say the girls’ department in stores. All they sold were pink and princesses. OK, and a small rack of adorable tie-dyed onesies. Since babyhood, my daughter — now 10 — has gravitated toward pink. She continues to have fits when confronted with even purple. Most recently, it was her hairbrush. She lost her favorite brush, and I found the exact one in purple for $2; in pink for $12. I don’t spoil her. I just understand that she has her own identity. And a new pink hairbrush. Dang. As for STEM (science, technology, engineering and math), I recently heard a friend tell her daughter that she’s “truly awesome” at math. Over her head, my friend mouthed, “Not really.” The strategy is to stoke the girl’s ego to encourage her. In our house, we emphasize effort, which involves daily homework. You may have heard the cries from your own house. It’s easier if there’s a device or art involved, so you’ll find my daughter doing math homework online while listening to Mamma Mia! for the 437th time (I wish I were exaggerating, but I’m not), or coloring elaborately on her math sheets. I get that everyone learns differently, and everyone has different strengths and different passions. Again, dang. 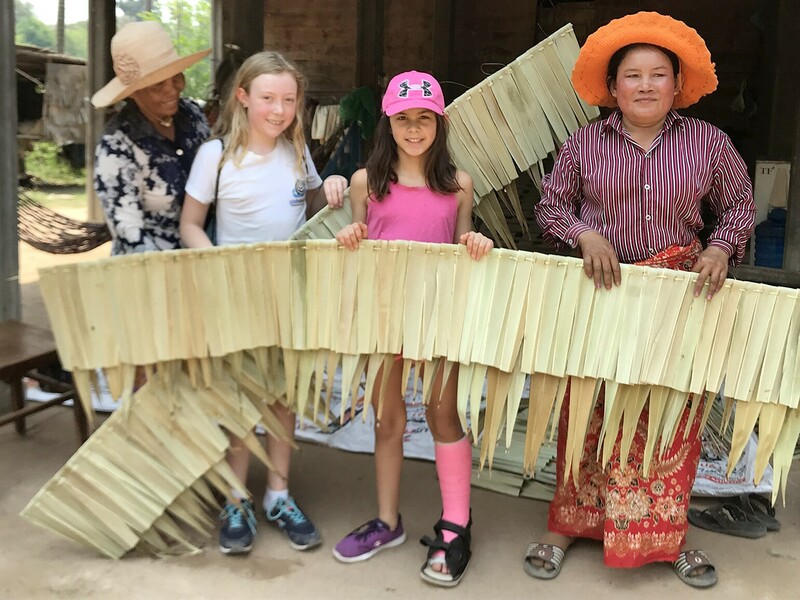 Johannah (with best pal Lauren Zeigler, left) weaved palm fronds for roofing on a volunteer vacation in rural Cambodia with Globe Aware. Yes, she broke her ankle a week before we left, but the pink cast made it bearable. I may not get an A in bringing up a feminist daughter. But I respect who she is: opinionated, caring, fun, totally adorable, good at what she’s good at, working on what she’s not good at. And effort, in our house, is what counts. For her, and for me. Just in time for the holidays comes She Did It! 21 Women Who Changed the Way We Think (Disney-Hyperion/AARP), featuring unsung women leaders in STEM, the arts, politics, sports and social movements. The young people in your life will see what it takes to make a difference. 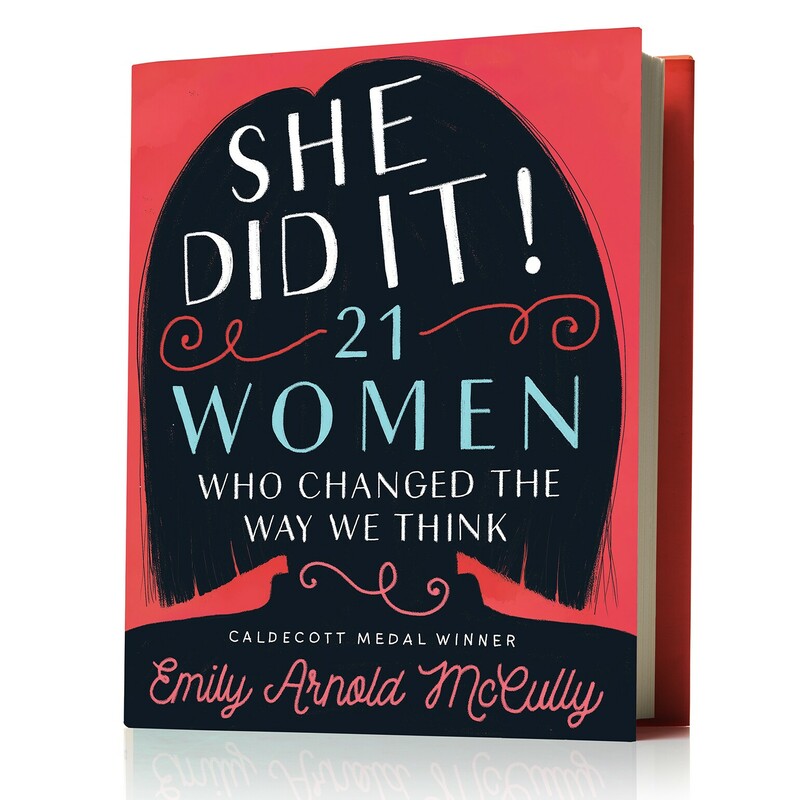 There is a chapter on AARP’s visionary founder, Ethel Percy Andrus, whom my daughter found surprisingly cool. The book is available wherever books are sold and at AARP.org/SheDidIt.